Below are some great articles and interesting news from around the interwebs, to complement CleanTechnica‘s obsessive coverage. Enjoy. Second, key climate solutions — renewables, efficiency, electric cars, and storage — have been advancing considerably faster than anyone expected, much faster than the academic literature anticipated. The synergistic effect of all these light-speed changes is only now beginning to become clear (see, for instance, my recent post, “Why The Renewables Revolution Is Now Unstoppable”. Third, the media and commentariat have simply not kept up with all these changes and their utterly game-changing implications. As a result we end up with recent articles in such prestige publications as Foreign Affairs and the New York Times that are literally out-of-date the instant they are published, as I’ll discuss below. Following the April and May announcements from Saudi Arabia concerning its ambitious 9.5 GW renewable energy target, Apricum, a cleantech advisory and strategy consulting firm, has published an initial response to this news. Trade war between China and the European Union is set to continue with the Asian renewable energy giant set to extend anti-dumping duties on EU solar cell raw material imports. Do We Really Need Solar That’s Too Cheap To Meter? Large amounts of wind and solar drive down market prices — a phenomenon known as the merit-order effect. And if wind and solar producers are dependent on those market prices for their income, they will also drive down their own revenues. David Crane, former CEO of the competitive energy supplier NRG Energy, once owned a bar and pizza shop in Hong Kong. “That was fun,” he said, addressing a small group of law students at New York University earlier this month. “Terrible pizza, though.” Crane is far better known for his career in the energy sector than for his work as a restaurateur. After picking up a law degree at Harvard, he went on to be senior vice president of global power at Lehman Brothers and executive director of International Power PLC, before taking the helm at NRG in 2003. The Australian CleanTech Index rose from 46.53 to 50.03 over the month of April, recording a 7.5 per cent gain. This compared to the ASX200 gain of 3.5 per cent and the ASX Small Ordinaries Index gain of 3 per cent. The Australian CleanTech 20 rose 7.3 per cent for the month. Gamesa India continues to be a leader in India’s wind energy market as it received yet another large order recently. The Indian subsidiary of Spanish wind energy company Gamesa announced, late last month, that it received multiple orders to supply a total of 198 MW wind energy turbines to project developers in India. Last year, Masdar announced plans to set up renewable energy projects in Egypt as part of its plan to expand into the emerging markets of Middle East and North Africa. The special projects unit of Masdar has now announced that it commissioned a total capacity of 30 MW capacity various parts of Egypt. This includes utility-scale hybrid solar power projects as well as off-grid solar power systems with facility of storage. Geely Motors owns Volvo and the London Taxi Company. 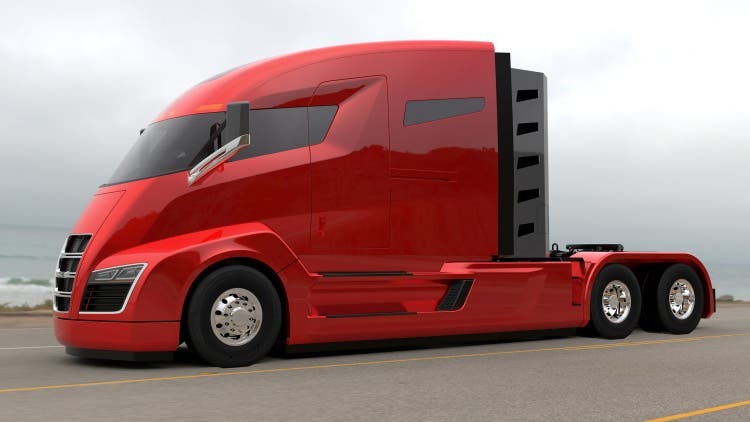 It also owns Emerald, which has developed the T-001, a plug-in hybrid delivery van with an electric range of 66 miles and a carrying capacity of 3,000 lbs. Bloomberg has coined the phrase “The Musk Doctrine” to describe the way Elon Musk keeps setting his goals higher in order to keep everyone working at maximum intensity. SunLine Transit Agency in California — a transit agency serving over 3.5 million people annually in the Coachella Valley — has added its first all-electric buses to its fleet. The new electric buses — which have been in use via a testing program by the transit agency since January — are 40-footers provided by the leading electric bus firm BYD. The buses have seating for up to 35 passengers, and can accommodate more than 60 standing passengers. Battery costs are plummeting to levels that make electric vehicles (EVs) a truly disruptive technology. Equally disruptive, those batteries can be used for low-cost electricity storage for many years AFTER they can’t power an EV. The electric vehicle charging station company ChargePoint has secured $50 million in new funding — in a fundraising round led by Linse Capital, along with Braemar Energy Ventures and Constellation Energy. The electric + hybrid drivetrain solutions firm Efficient Drivetrains has begun offering an electrification kit and developer support program to help manufacturers develop plug-in hybrid offerings. A team of scientists from the US Department of Energy’s (DOE) Brookhaven National Laboratory, the University of Pennsylvania, and the University of Maryland, College Park, has developed an electron microscopy technique to visualize—in real time and at high resolution—lithiation pathways in electrode materials. The German electronics giant Bosch has opened a new “innovation” center — focused on hardware and software for vehicle connectivity, automotive security systems, and motorized two-wheelers — in Lund, Sweden. Elon Musk is the most influential person in the car business according to the editors of The Drive. The head of Tesla is recognized as the one person driving industry change more than any other. How does RMI’s 15,610 square foot innovative new office building and convening center in Basalt, Colorado, have no traditional central heating and cooling system, in spite of being located in the coldest climate zone in the continental U.S.? The answer is passive, integrative design. The climate change activist group “Reclaim the Power” will be looking to shut down a dozen “major” fossil fuel sites around the world in May, as part of its “Break Free 2016” campaign. Thanks to human ingenuity and persistence, hydropower energy represents one of the oldest power sources on this planet. Best, its is clean, renewable, and sustainable as long as there is available water. That may be a larger challenge, according to some viewpoints. f you imagine a green city, you might not first think of Houston, Texas, but according to a green building index, over half of the commercial square footage there has an EPA Energy Star or LEED rating. In fact, Houston has ranked as high as number 3 in the US for LEED-certified commercial space.